I want to tell you about Someday, Someday, Maybe, but first I have to give you some background. Not background on the book - although I will tell you it was written by Lauren Graham of Gilmore Girls and Parenthood fame, and that is more than enough background to make it a must read, or at least, a must try. I love Lauren Graham. Background on my day. It was terrible, horrible, no good, and very bad (wait, that's a different book, isn't it? ), and I was in that place where you want to scream until your voice gives out, and then cry until you fall, exhausted, into a sleep that will last the rest of the day and through the night. But that wasn't a possibility, because I needed to be a responsible adult, and given the amount of shared walls where I live, the angry phone calls from all my neighbors would have interrupted any nap I may have achieved. I decided to turn to a book instead. Books are always the answer, but sometimes it is hard to find exactly the right book to cure a bad day. 1. It can't be too depressing. Some sad moments are okay, and some books are deliciously sad in just the right way. But there is a fine line between "helped me get my emotions out" and "I feel like the author wants me to use the pages of this book to slowly slit my wrists." When I am already tending toward a depressive episode, I don't need any help slipping further into that dark pool. 2. It needs to have fluff, but not too much fluff. I shouldn't want to throw the characters (with suddenly magical, perfect lives) across the room while yelling, "Yeah right, of course you are going to meet a great looking millionaire who immediately falls in love with you, and takes you away to a cabin in the woods far away from all your problems. While there, you will grow a garden, learn to make preserves, fix a truck, trace your genealogy, and discover you have a huge, loving family in Ireland just waiting for you to visit. You will save a baby wolf from drowning, and he will become your perfectly behaved pet that has a psychic connection with you, and warns you of any impending danger. Ooh. And, you are also going to send off the 10 children's books you have secretly been writing and illustrating for the last five years. They will be published, and become instant best sellers. That is just like real life. Excuse me while I throw up." Fluff like that will just make me feel worse, not better. 3. It needs to have enough depth to draw me in. If I need to make a spreadsheet to keep track of all the characters, I need to save that book for a different day. If the first three chapters are told from different perspectives, none of which seem related, as if I have been plopped into the middle of three extremely different stories...well, the brain fog is already setting in, and even though my eyes are going over the words, my mind is anguishing over every bad choice I have ever made (starting with that plastic pink bow I wore in my hair on the third day of first grade), and figuring how they all worked together to bring me this very bad day. 4. It needs to have characters I can really love. A really good "bad day-fixing book" will not just distract my mind for the three hours it takes me to read it. It will continue to fix my day by giving me things to think about for many hours after I close the cover on the final page. This happens when I really love a character, and want to sit with them longer by analyzing every detail. Sometimes this turns into obnoxiously long emails to other people who have read the book, discussing every single thing I thought about it. 5. It gets bonus points if it can make me laugh, really laugh, out loud. I don't often laugh out loud at a book, or even a movie or television show. So when a book make me not only giggle, but really laugh, I have to love it. It can't help but make a bad day better. Now that we have established those rules, you know exactly the kind of book I was looking for this week on my very bad day, and I am happy to report that I found it. Someday, Someday, Maybe is the story of Franny Banks, an aspiring actress in 1995 New York. At first I was a little thrown by the 1995 thing. 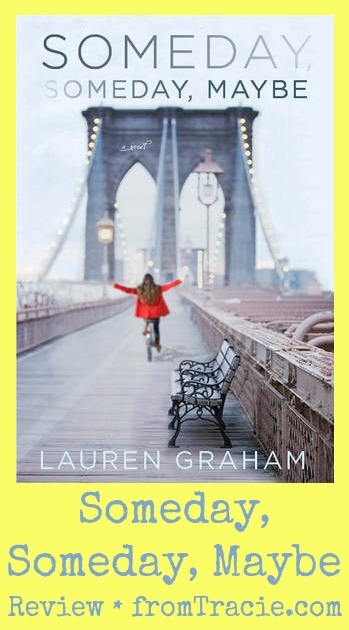 I figured the book would have some autobiographical details in it, but felt like Lauren Graham could have updated it with a contemporary setting. But it turns out, 1995 was perfect. Franny has an answering machine with a tape, and uses pay phones to call home and check her messages. She carries a Filofax to keep track of appointments and write notes about her day. (I love when books have handwritten pages pulled from the character's lives.) Even with the 90's element being very obvious, it did not feel dated, and the little touches didn't come off feeling unnecessarily nostalgic. The thing that is special about this book is Franny and her inner dialogue. It is perfect. I want to say quirky, but that will give you the entirely wrong impression, like she is just another book character with a quirky personality. No, her inner dialogue feels right, and it is well-paced. Here's the thing about Franny: you want to be her friend. I wanted to be her friend. She wasn't annoyingly perfect or frustratingly imperfect. She was real. In Someday, Someday, Maybe, Franny dreams, she works hard, she grows, and she finds love - all the ingredients to chick lit, but Graham pulled it off without feeling like a straight-up chick lit book in the moment. And it gets bonus points for making me laugh out loud. Not on every page, or even in every chapter, but just the right amount. There were a couple of moments when I was scared Graham was about to fall into the predictable chick lit hole (secretly rich boyfriend? big movie deal at just the right moment? you know you have seen them all), but she pulled it out of the hole every time. There was even this great self-aware moment when Franny and her roommate Dan discuss love triangles in such a way that I was ready to forgive any love triangle ever written - but mostly just this one, because even though it was a triangle, it wasn't. And to understand that, you will just have to read the book. I know I have officially used the word "perfect" way to many times in this review, but that is the only word that fit. It was perfect. I loved every page. Lauren Graham needs to write more books immediately. What is your go-to type of book for reading on a very bad day? *Although Someday, Someday, Maybe is the perfect turn-my-bad-day-around book, it would also be a perfect any-other-day-you-want-to-read-it book. Seriously. Just read it. You won't be sorry. I love your criteria for a great read on a bad day. And I love Lauren Graham! Will have to check it out! I'm sure you will love it. Lauren Graham is the best. I have a stack on my nightstand. I read for like 10 min before bed. When I travel I read nonstop though...I love to read. But really, anything I can lose myself in is the perfect book for me. Sometimes easy reading is just what I need, and other times I like to have something with a little more meat. I didn't answer that question very well, did I? LOL. It is a harder question to answer than it seems on the surface. I love getting lost in a good book. Oh, so funny!! I pulled this out of the library while on vacation, but since I didn't finish it, I had to leave it on Cape Cod so my mother-in-law could return it to her library. Bummer. Now I'll have to get it out of my local library. I love Lauren Graham. I have never missed an episode of Gilmore Girls or Parenthood. Oh no! I hope your local library has a copy available. Maybe your mother in law will get to read it, too, before she takes it back. We own all of the Gilmore Girls on dvd, so I have watched them over and over again. I haven't missed any Parenthood either. It is definitely one of my favorites. Sounds like a great book, Tracie - adding it to my to-read list right now! Hope today is a better day for you. So very true. If only we could stop time while reading....so many more books would get read. It sounds like a great book. I tend to go for lighter reads in general - and especially on horrible days. I love reading and want to enjoy my time spent with a book, I don't enjoy feeling distressed about fictional characters, so I keep things more toward the thoughtful, yet more humourous books. This makes me think about that meme that says something like, "That moment when you look up and see everyone going through their life like normal, not realizing that you just experienced emotional trauma at the hands of a paperback." Great review! 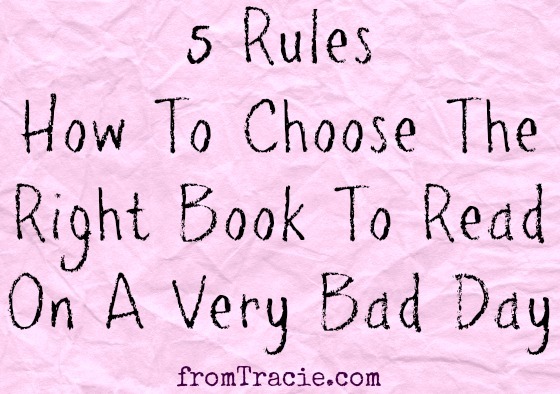 (and great tips for choosing the right book on not so great days!) I have this book on my hold list at the library...can't wait to read it. Thanks!! I'm excited to hear what you think of it!